Handy CD Ripper is an easy to use and powerful Audio and Data CD/DVD Ripper. 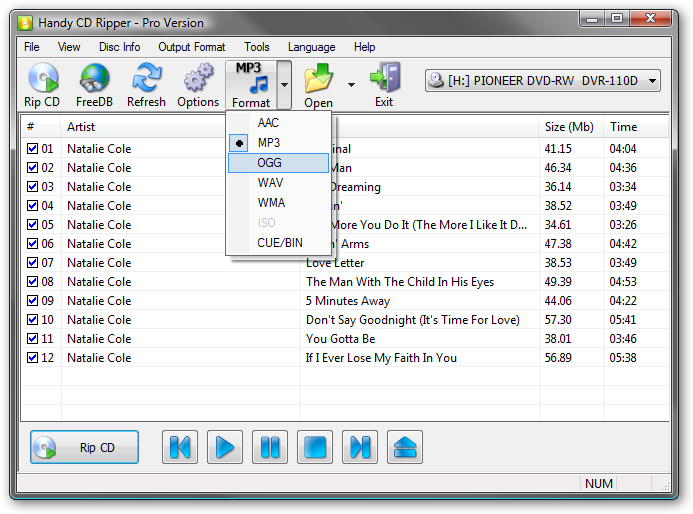 Handy CD Ripper lets you rip Audio and Data CDs and DVDs easily and quickly. The following output file formats are supported: mp3, ogg vorbis, wma, aac, wav, cue/bin, iso. FreeDB (free compact disk database) is supported. You can find disk info in one click! You will enjoy working with this application due to the extremely easy-to-use and flexible interface. * Various cd ripping speeds are supported to help you rip old and scratched cds. * Customizable output file name - you name it! * Portable version of Handy CD Ripper is available! Qweas is providing links to Handy CD Ripper 2.5.5 as a courtesy, and makes no representations regarding Handy CD Ripper or any other applications or any information related thereto. Any questions, complaints or claims regarding this application Handy CD Ripper 2.5.5 must be directed to the appropriate software vendor. You may click the publisher link of Handy CD Ripper on the top of this page to get more details about the vendor.